DJ Shadow - The Private Press. Vinyl LP. Bleep. 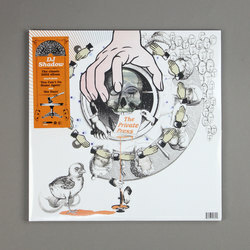 DJ Shadow’s 2002 sophomore LP gets the reissue treatment courtesy of Universal. Despite the huge expectations Shadow was under to top 1996’s Endtroducing, the plunderphonics pioneer rose to the challenge with ease on his follow-up record. Indeed, there is a school of thought which decrees that this album may be of superior quality to its famous predecessor. Whether or not you feel the same way may just be a matter of personal preference, but what is undeniable is that Shadow expanded his sound here while still remembering to do the basics right. This means that ambitious takes such as the epic Vangelis-meets-Moby number ‘Blood On The Motorway’ dovetail nicely with the wacky instrumental hip-hop cuts like ‘Walkie Talkie’. All site content copyright © Bleep Ltd. Registered office: Spectrum House, 32–34 Gordon House Road, London, NW5 1LP. Company Registration Number: 11793693. VAT Number: GB 315 0760 32. For information about cookies that are required for this website to operate correctly, please read our cookies policy. Google Analytics is used to track usage of this website anonymously. Turning off will mean that your IP address is not sent to Google. This site tracks activity, used for customised advertising across several services (Facebook). Turning off will mean that your activity is not sent to these services.